First of all, thank you all for your patience. I have a huge backlog of recipes and the last few days, I have been caught up in dealing with the change of weather here. I am yet to adjust to the new winter timings . Also, you would have heard about the high pollution levels in Delhi NCR, that is making many of us sick. Praying that the situation will get better soon. From our end, we should try and keep our environment cleaner for our own wellbeing . To start with, we can carry our own bags from home whenever we step out. Also, planting trees/ plants around our home are small steps towards cleaner air but will together make a huge difference. 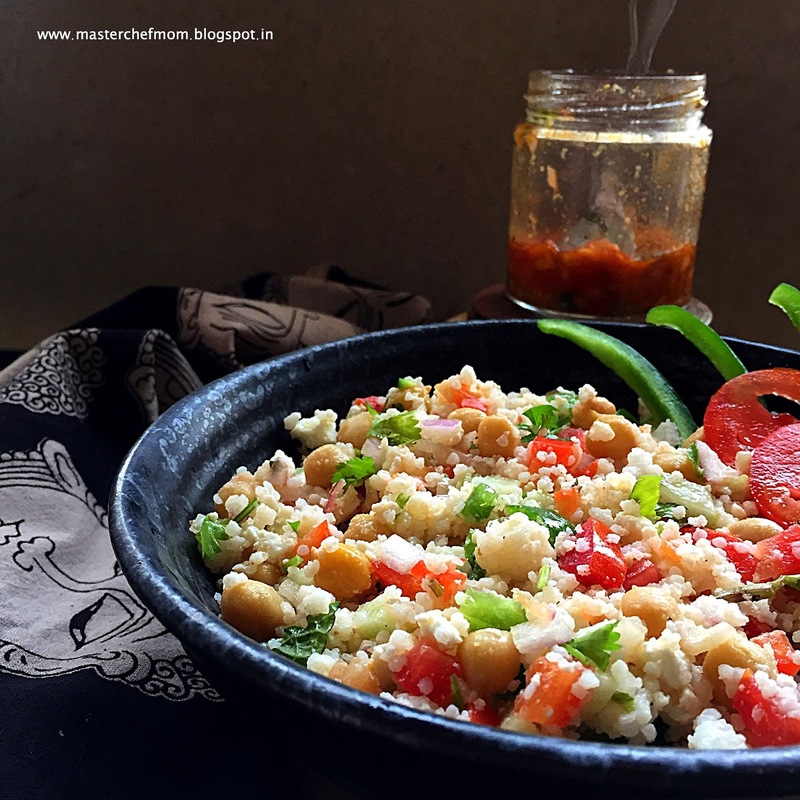 Coming to today’s recipe, it is a part of my attempt to make salads that can be served along with Indian meals and also that can stand alone as a ‘meal’ . I am not used to eating vegetables raw except for a very few of them . I am sure many of you ( from India) can relate to what I am sharing. Also, it is a different way to use the millets. So, keeping these pointers in mind, I proudly present another salad – Indian Style Little Millet Salad in a Garam Masala Vinaigrette dressing. 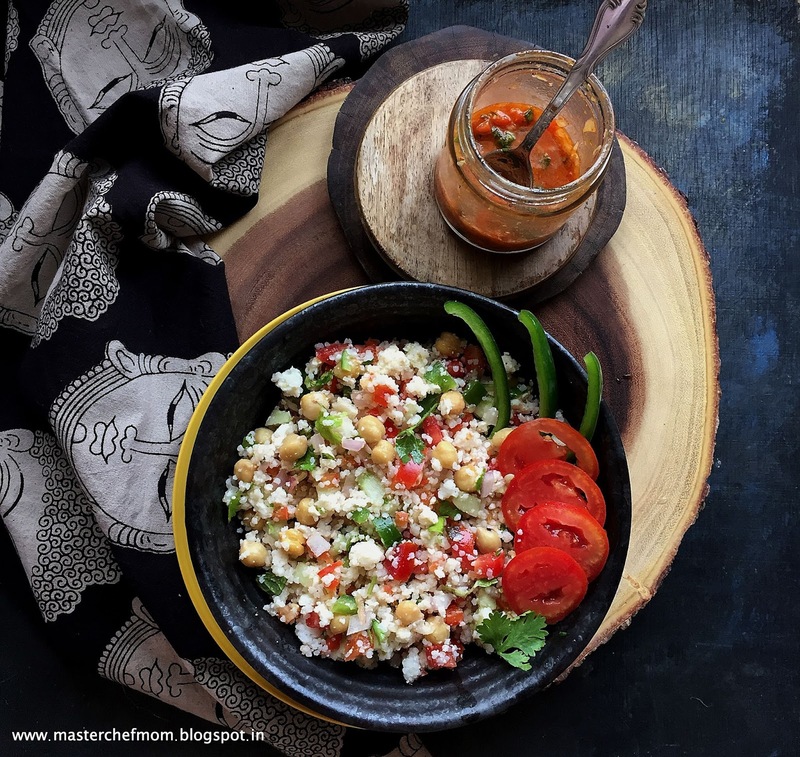 Simple, healthy and delicious . You can enjoy this salad warm or cold. You can prepare this salad for your get togethers and parties ahead of time and refrigerate. Really convenient. Also, they are best to pack for lunch box . I have added cottage cheese and chickpeas /chole/garbanzo beans because I had soaked them in advance. You can use any legume of your choice, sprouts will be great too . Also, instead of paneer, you can use Tofu or completely omit it . Use vegetables of your choice. Let us have fun building this salad, shall we ? Special Vessel/equipment: 1 small or medium size bottle for the Vinaigrette. Chef tip : You can make a larger quantity and store it in the bottle. Each one can add extra according to their taste preference. Also, taste the vinaigrette and adjust spice powders and sweetness according to your palate. The vinaigrette stays good for 3-4 days when kept refrigerated in a clean, odour less and air tight bottle. .
1. Take a small clean bottle , add the oil and vinegar, close the bottle tightly and shake well. 2. The mixture will emulsify. 3. Now add all the spices, vegetables given under ‘ For the Garam Masala Vinaigrette’, close the bottle and shake again . 4. Your Garam Masala Vinaigrette dressing is ready . Let us now prepare the salad. 1. Chop all the vegetables and boil the chick peas. 2. Cook the samai / little millet using 1 1/2 cups water ( one and half cups of water) till they are well cooked and soft. Make sure they don’t turn mushy . 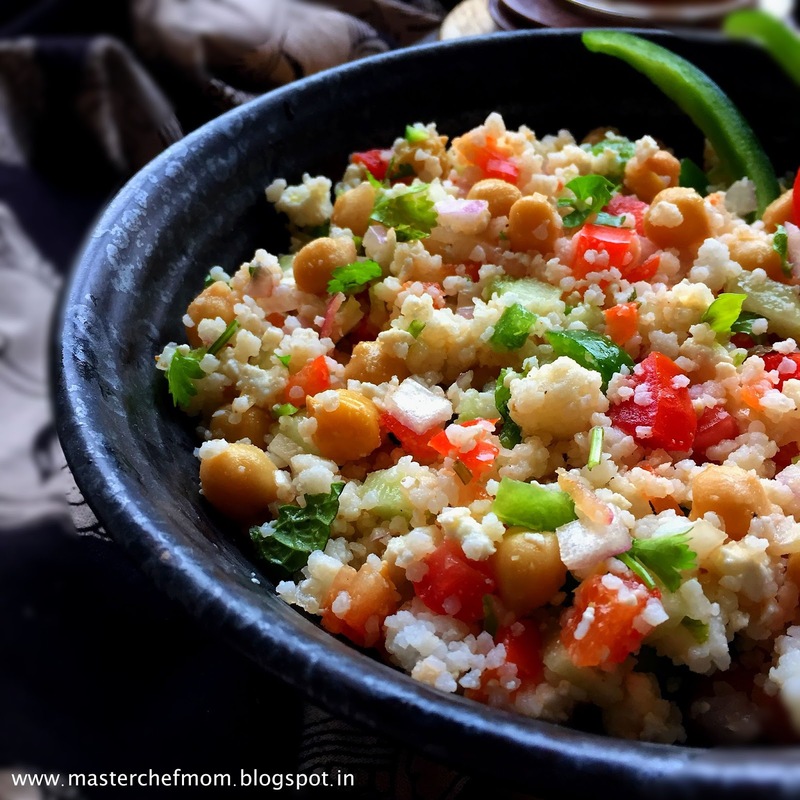 Little Millets/ Samai can be cooked two ways. a.You can pressure cook them upto 2 whistles and switch off. b. You can cook them in an open pot . c. It takes approximately only 10 minutes to cook them . d. Soaking them in water for at least 30 minutes, helps it to cook faster. 3. You can use a ladle or fork to toss them so that even if a few of them stick together, it will loosen them up/fluff up. 4. Add all the chopped vegetables , herbs and mix well. 5. Add little salt ( as the vinaigrette also has salt) and mix again. 6. Spoon vinaigrette into the salad and toss well. Chef tip : Add quantity according to your liking. Best way to find out is to mix , taste and adjust spices and salt. You can squeeze juice of lemon if you like . Your Indian Style Little Millet Salad with Garam Masala Dressing is now ready to be served immediately or you can refrigerate them for a few hours and serve them cold. They taste even more flavourful after a few hours. I am sure your family will love this taste. It is sure going to change the way they are going to look at salads .